With 17-gallon capacity and 300 CFM, this vacuum can handle the big concrete cutting and surface grinding applications. Mt. Prospect, Ill., Oct. 10, 2018 – The Bosch GAS20-17AH Wet/Dry Dust Extractor is an industrial-grade powerhouse with a maximum 300 CFM (cubic feet of air per minute) capacity that filters fine dust, coarse dirt and liquids. The GAS20-17AH boasts 17-gallon capacity, and auto filter cleaning with HEPA filter to provide a complete package in helping users move toward OSHA silica dust regulation compliance. Its auto filter-clean system activates every 15 seconds and the HEPA filter captures 99.97% of particles at 0.3 microns and larger. The dust extractor features a high-performance 17.5-amp motor to maintain the maximum 300 CFM capacity. This is powerful dust extraction performance for heavy-duty applications, including concrete cutting and surface grinding with larger 7" and 9" grinders and up to 12” cut-off tools. The Bosch GAS20-17AH Wet/Dry Dust Extractor automatic filter-cleaning system self-cleans the HEPA filter through reverse airflow every 15 seconds. This procedure ensures that the extractor is always working at maximum efficiency. The large capacity Bosch wet/dry extractor has a water-level sensor to help preclude overfilling and a discharge hose for easy drainage. The easy-to-transport unit has sturdy metal castors designed to withstand jobsite terrain, a metal frame with a height-adjustable fold-down push handle for easy maneuverability. The unit features a dumping mechanism for emptying convenience. The Bosch GAS20-17AH Wet/Dry Dust Extractor comes with a HEPA filter, a three-layer heavy-duty filter bag that helps protect the filter from abrasive materials and a 16 Ft. anti-static hose. Part of the Bosch PRO+GUARD™ system, the GAS20-17AH with HEPA filter helps users move toward compliance with the OSHA silica dust regulation. With its maximum 300 CFM, it is designed to handle concrete cutting and surfacing with large angle grinders. And optional Y-Connect (sold separately) – allows use of two tools at the same time, such as small (5" or smaller) angle grinders used in surface grinding or cutting concrete. 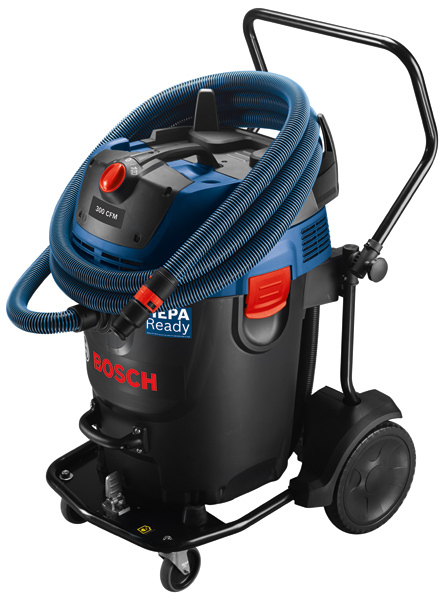 To learn more about the Bosch GAS20-17AH Wet/Dry Dust Extractor or to find a local dealer, visit www.boschtools.com or call 877-BOSCH-99. Check out www.bethepro.com for additional tips and videos. Bosch GAS20-17A 17-Gallon 300-CFM Dust Extractor Kit includes a VF430H HEPA filter, a three-layer heavy-duty filter bag, a 16 Ft. 35mm anti-static hose, a bend nozzle, a power tool adapter nozzle, two extension tubes and a floor nozzle.